I was making a table runner. That was the plan. In actuality I completed 2 Place Mats and pinned up a Table Runner. Was fun sewing with others. Besides myself there were 4 other woman. My Love does not like them. I think they are nice. Looking for your feedback. I was considering gifting this to someone. 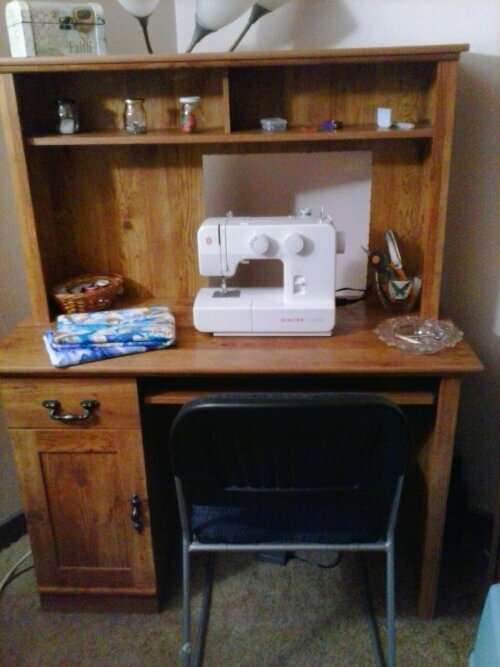 Now it is my sewing nook! Not so sad now!!!! In the last 4 months I have acquired quite a bit of sewing supplies! Many items given to me from those who know I am exploring my creativity….for these people I am thankful! However, last evening I realized I have supplies in all rooms of my home! Guess I got a little out of control….lol. So I spend a few hours last evening reorganizing. I now have a better grasp of what I have and even ideas on projects. When My Love saw the pile of future projects he questioned if I have enough time to get everything done. Silly man….there’s always time!!!! The projects are: Tote Bag ( I started last fall), Kindle Case, Table Cover, Pillowcases, Pillow, Table Runner, Mug Rugs, Towels ( adding sewn trim to pre purchased towels), cover for the top of a Washing Machine, Dresser Scarves. Oh that’s right you don’t know do you? I went to work and two people asked if I would make them a Key Strap. I agreed. Then they asked if I would make them for Christmas presents for their friends and family? My immediate reaction was astonishment!! Here I just made one because I was sick of losing my keys in my purse. After thinking about it for a brief moment I said I would do it! I am still in shock that someone is willing to pay me to make Key Straps for them. Got another order today for one. Things are looking good from where I am sitting!! I guess the time is coming for me to admit that I have talents and creativity in me. Nah….not ready yet!